Hi, this is a continuation from my last post, and it's done!! 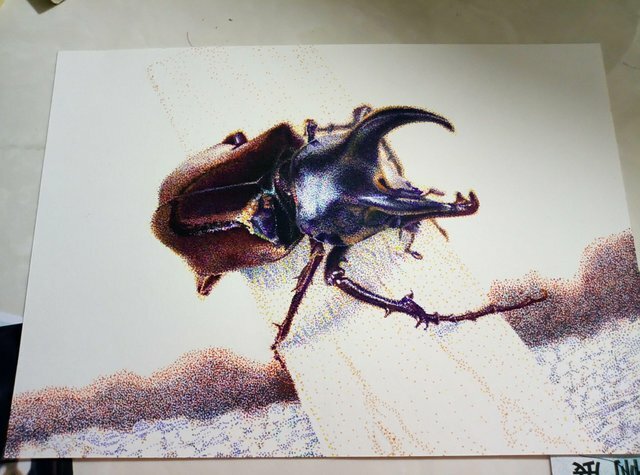 This drawing is all done by dots of markerpens. Best of all, I could empy my worries and focus on hitting those dots. If you are interested, please visit my first post and the second post. I recognized it's similar to coloring book that you will be following the given path. So it's really good for me to do this in between other of my art creation, which I constantly thinking; am I doing it okay?, is this looking cool?, is that color suits with this? etc. All right. So with this technique, I am using colors, so thought of color combination and proportion accuracy. I carried out with its legs and now to the background. There were orange color around the beetle, so I put some warm color in the background to blend in. Something blurry and warm, to give depth. Lastly, I almost forgot about the wood plank. In the original photo, it was entirely a white wall, and here I changed to have depth, so I....errr.. cogh cogh.... I improvised the wooden texture! I added some shadows at the bottom so it looks standing up right. Thank you for reading, the artworks in this post is done by me, @naomipangolin. The source of the second image is from here. 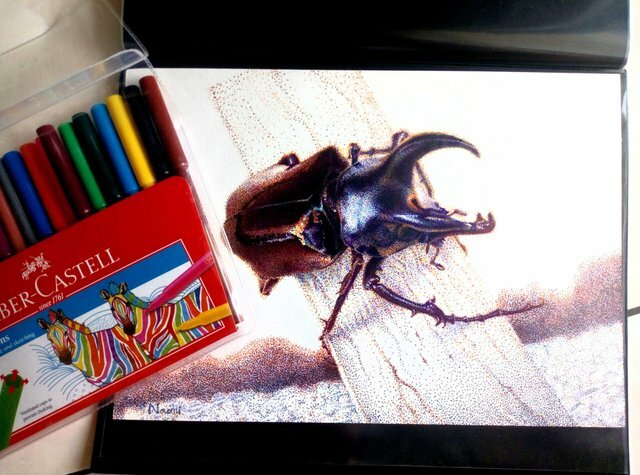 Well..well @naomipangolin... if I happened seen this painting from far away, I think I'd come closer and try to touch it to make sure it's not the real bug😊 awesome job! Thank you @taffel! I think that beetle is the beauty. Thank you @c-squared! Your attention is a big support to me. Yes I will vote too. Excellent work, @naomipangolin! We can even see its back shining. Very nice !!! 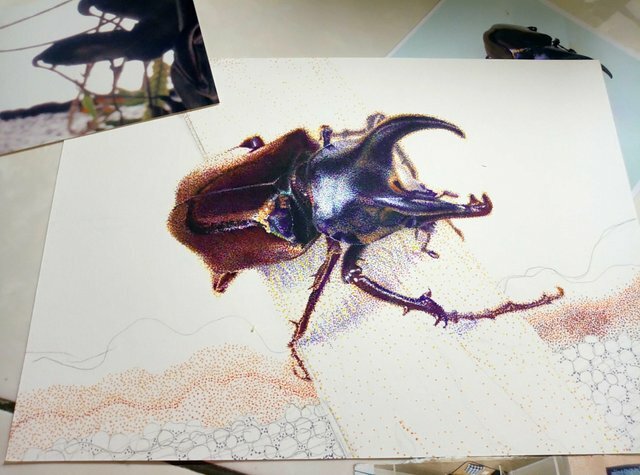 It already looked really cool at the work in progress post, but this finished version looks super wonderful <3 You are super talented with this pointillism style, @naomipangolin !!! Thank you so much @veryspider ❤️❤️❤️, unfortunately my husband told me to take rest from art making for this year😅 will be checking my old albums for the upcoming year!! I think your work needs lots of concentration @naomipangolin. Apologies for all my questions, but it's intriguing to me. Do you have breaks when working ? Do you leave your work for a day and come back to it ? I thought it was a real bug, too! The detail is quite incredible. Your color choices could not be more perfect! A beautiful work of art!